Christmas pillowcase with colorful LED lights inside, perfect decoration for your bay window, bedside, car, sofa and much more! 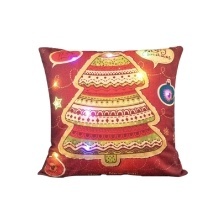 18 * 18 inches LED pillowcase, with Christmas pattern on one side, perfect decoration for Christmas. Built in colorful LED luminescent light strip, more beautiful and attractive. Powered by 3 * AA batteries(not included), one button to turn on/off. Made of linen material, tear resistant and wear resistant. 1. Cleaning is not recommended. If you want to clean, please clean it carefully and keep the battery box(NOT waterproof) away from water. 2. Pillow cover only, pillow is not included. 3. Because of the different monitor setting, item&apos;s color may be slightly different.